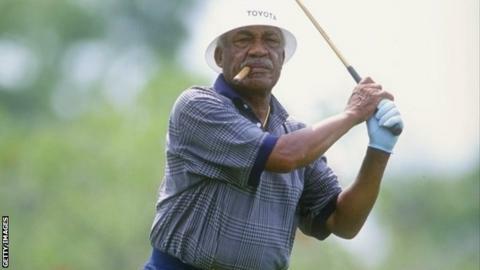 Dr Charles "Charlie" Sifford, the first African-American to play on the PGA Tour, has died aged 92. A former caddie, Sifford became the first black player in PGA-sanctioned events in 1961 when the "Caucasian-only" membership clause was dropped. Sifford won two PGA Tour events, in 1967 and 1969, but had many victories prior to his official admission. Tiger Woods credited Sifford for paving the way for his own golfing path, and called him 'the grandpa I never had'. Sifford was often called the Jackie Robinson of golf, a reference to the late baseball player who was the first African-American to play in Major League Baseball. He won the PGA Seniors' Championship in 1975, five years before the current Champions Tour was established. Last November he was awarded the Presidential Medal of Freedom - the highest civilian award in the United States - by President Obama, only the third golfer to receive the award after Jack Nicklaus and Arnold Palmer. "It's not an exaggeration to say that without Charlie, and the other pioneers who fought to play, I may not be playing golf," Woods told The Associated Press last year. "My pop likely wouldn't have picked up the sport, and maybe I wouldn't have either." Veteran South African Gary Player, winner of nine major titles, told BBC Sport: "One of the great honours ever bestowed upon me was an African-America asking a white South African to induct him into the Hall of Fame. "We had very similar careers, they wanted to kill me for years, I wasn't allowed to play in Japan, Denmark, Sweden and a lot of countries because of my country's policies so Charlie and I were denied the privilege of playing in a lot of tournaments. "He never ever gave up - it was in his nature to keep fighting. When he was given that honorary degree in Scotland I cannot tell you what it meant to him. He said, 'laddie can you imagine that at the home of golf Charlie Sifford will be receiving this honour?'. It was just marvellous."